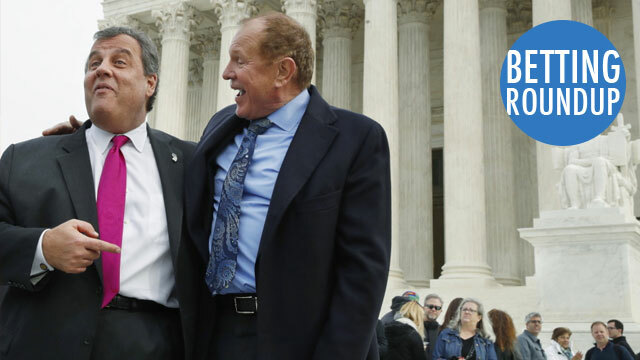 The Supreme Court heard arguments in New Jersey’s sports betting legalization case this week. The decision should be released in the first half of 2018. ESPN Chalk’s David Purdum interviewed Dr. Adam Feldman, a postdoctoral fellow at Columbia Law School and creator of EmpiricalSCOTUS.com about the oral argument session. What clues did you find that may indicate how certain justices may rule? Dan Wolken wrote an article for USA Today about how the NCAA would respond to legalized sports betting. And as much as they might fight it, people at the NCAA are smart enough to know that a major change in sports gambling laws ultimately will usurp any attempt to remove events from states that make it legal to wager on their games. If sports betting does become legal nationwide, the NBA has put themselves in a better position than other leagues to take advantage. The NBA is looking to be a leader in the space, entering into strategic partnerships, opening the door to major casino sponsorships and seeing a number of owners invest directly into the sports betting industry. The decision could also be a “game-changer” for the state of New Jersey. A fully mature New Jersey sports betting market, including online, could produce $502 million in gaming revenue, according to industry research firm Eilers & Krejcik Gaming. A study by Oxford Economics found that roughly $8 billion could be wagered annually on sports in a New Jersey legal market. Clearly, for both the tracks and casinos, being able to offer legal sports betting wouldn’t hurt. That’s the plan at the Borgata, where Jay Rood, vice president of race and sports for MGM Resorts International, traveled in mid-November to scout possible locations to install a sportsbook. The design and budget for building the Borgata book are still being discussed, Rood said. William Hill is taking a similar approach at Monmouth Park. The second phase of the transformation plan features a spruced-up, overflow area in the grandstand outside of the current sports bar, which would expand the capacity by approximately 2,500 people, according to Dennis Drazen, an attorney who represents Monmouth Park. The third phase is the construction of a standalone sportsbook, similar to what you might find at a William Hill sportsbook in Las Vegas. “I don’t think you can have enough TVs,” said Asher, William Hill’s CEO. An outdoor dining venue, currently home to The Lady’s Secret Café, and valet parking are two areas being considered for the new sportsbook, estimated to cost $5 million or more. But, for now, the new Monmouth Park sportsbook is still a ways down the road. There’s a very real chance the track — and other New Jersey gaming operators — could be taking bets at some point in 2018. “We can be open to take wagers in two weeks,” Drazin told ESPN. With possible sports betting legalization on the way and a canceled merger between DraftKings and FanDuel, daily fantasy sports industry is in an interesting place. It has been a weird year in the daily fantasy sports (DFS) industry. The two leading companies in the space, DraftKings and FanDuel, canceled their planned merger, eight months after announcing it, and after their lead executives spent many more months working together behind the scenes to pull it off. It was supposed to be a synergistic combination of two close competitors into one dominant platform. Instead, as we head into 2018, DraftKings is, by most reports, the definitive leader in DFS by market share and has taken a step into streaming live sports. FanDuel CEO Nigel Eccles, credited with fueling the rise of DFS (FanDuel launched four years before DraftKings), has left the company. Perhaps most important: On Dec. 4, the U.S. Supreme Court will at last hear the New Jersey sports betting case, Christie et al v. NCAA et al, which will determine whether New Jersey can allow sports betting despite the existing federal ban, PASPA (Professional and Amateur Sports Protection Act of 1992). College football sports betting popularity is gaining on the NFL in Las Vegas. At the Westgate SuperBook, there have been numerous weeks in recent seasons in which Jay Kornegay has watched his clerks write more tickets on N.C.A.A. games than those in the N.F.L. He notes that college football offers a bigger menu of games that can be bet on — often more than 50, spread out from Tuesday to Saturday — and that there has been a steep increase in the popularity of betting apps on cellphones, taking away any stigma attached to wagering.